Westgate is the hub for the large and rapidly expanding communities of Auckland’s North West. Containing retail, commercial and community uses, it covers a large area and has excellent transport links, in particular incredibly easy motorway access. Westgate Shopping Centre itself, is a vibrant mix of large format stores and speciality retail in an open air setting. It’s a hub for shopping, dining and entertainment including a cinema, tenpin bowling alley, mini-golf, restaurants and bars. 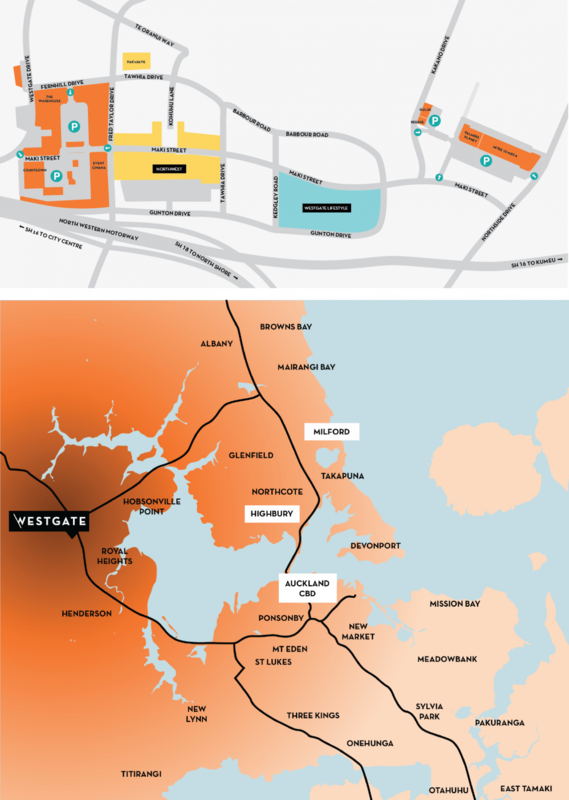 Westgate is a significant town development in Auckland and is quickly solidifying its position as the North Wests’ complete destination to shop, work and play – be a part of it. Don’t miss out on your chance to be part of Westgate’s future. Talk to us today to find out about leasing opportunities at Westgate, phone +64 9 831 0200 or email leasing@nzrpg.co.nz. You can also view the Westgate leasing book here.